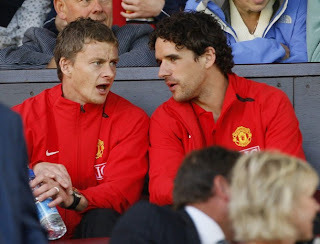 Today is the testimonial footie match for Manchester United's cherub-faced striker, Ole Gunnar Solskjaer (pictured left, with United's Owen Hargreaves). It was a sad day in United land when Ole had to call it a day on his career after never-ending knee problems. Ole is a class act and there was never a player as deserving of a testimonial than the 'Baby-faced Assassin.' Thanks, Ole!